Welcome to February. While some people find January the toughest month of the year I definitely get the February blues. As I write this it is grey, overcast, windy, and cold outside (although this is England so that could be any day in any month). Lucky for you (and for me) I read a couple of great books that I get to tell you all about. 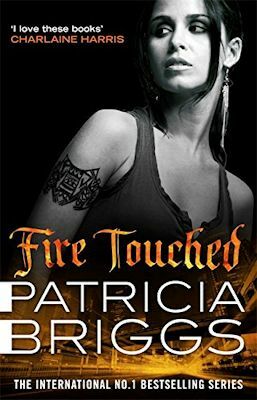 First up is Fire Touched by Patricia Briggs which is the 9th in the Mercy Thompson series. In this instalment tensions are running high between the werewolves, the humans and the fae. After saving her city from a rampaging troll Mercy discovers a way a key to help slow down the escalating tensions with the fae - a human child who was kidnapped by the fae centuries ago. Mercy and her mate Adam decide to protect the child regardless what the cost, and the cost turns out to be pretty high. This isn't your average human child as the young boy is fire-touched and could turn their very lives into a pile of ash. Is this boy worth being excised from The Pack? You need to read it to find out. 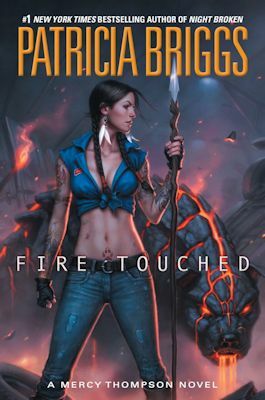 I have been thinking since about book 6 that Briggs needed to start to wrap this series up as I was getting a tad bored with Mercy getting beaten up every instalment (or worse). 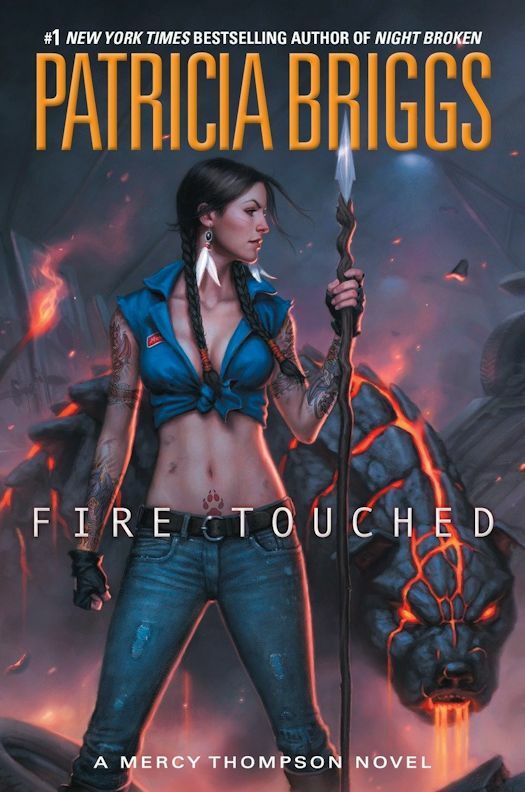 The last book she nearly dies after being almost barbecued by a volcano god. But guess what readers? She barely gets a scratch in Fire Touched! What a relief. This book still had action but more importantly character development. There were actually repercussions from Mercy's actions but this time they weren't physical. All in all a great read. I have also included both covers. Which one do you prefer? One is a bit more graphic novel than the other and I don't think Mercy ever wears a denim crop top! 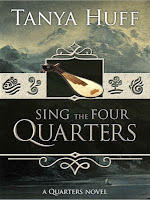 Book 2 for me was Tanya Huff's Sing the Four Quarters. This book was first published 22 years ago and re-released in digital format last year. I love Tanya Huff and I really enjoyed this first instalment of the Quarters series. Annice is a bard, not just any bard as she can sing all four quarters. What does this mean? She can sing to the all four of the kigh (aka elementals) -wind, water, earth, and fire. When Annice comes back from a Walk no one is more surprised than she that she is pregnant. Normally, this wouldn't be considered treason, but Annice was forbidden to have children by her brother, the new king, when she left the royal family to be trained as a bard. What makes it worse is that the father of her child is found to have committed treason and Annice is determined to clear his name. If you like high fantasy, amusing characters and a nice mystery then I urge you to try this book. I am not sure however, I will continue with the series as subsequent books are about completely different characters. I liked Annice and the other bards so not sure I want to read about completely other characters, especially when I have a few books on my TBR to get through. Who knows, I may just grab book 2, Fifth Quarter, and try it out. That is it for me this week. Nice and short, just like February! 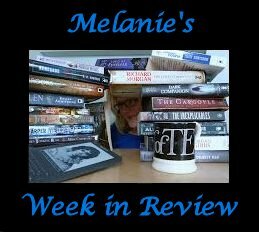 Enjoy whatever you have on the go and I look forward to sharing with you what I hope are some more great reads. The Bards of Shkoder hold the country together. They bring the news of the sea to the mountains, news of the mountains to the plains. They give their people, from peasant to king, a song in common. Annice is a rare talent, able to Sing all four quarters, but her brother, the newly enthroned King Theron, sees her request to study at the Bardic Hall as a betrayal. But Annice renounces her royal blood and swears to remain childless so as not to jeopardize the line of succession. Ten years later, she’s on the run from the Royal Guards with the Duc of Ohrid, the father of her unborn child, both of them guilty of treason – one of them unjustly accused. To save the Duc’s life, they’ll have to cross the country, manage to keep from strangling each other, and defeat an enemy too damaged for even a Bard’s song to reach. I agree with you about February. January is recovering from the holidays from Thanksgiving to Christmas. LOL February is just waiting for March and spring. Happy reading.